Not exactly a continuation of Veep creator Armando Iannucci’s brilliant British series The Thick Of It, In The Loop is like a reboot set in a slightly alternate universe. Cast member Chris Addison recurs, but instead of perpetually flustered policy aide Oliver Reeder, he’s a distinctly more mercenary political operative; the movie’s Olivia Poulet was cast in The Thick Of It’s third and fourth series as another, entirely different, character. But there are two crucial constants. Like The Thick Of It, In The Loop sends up the small-potatoes bickering of British politics. More importantly, it also carries over the iconic character of Malcolm Tucker, the blisteringly foul-mouthed spin doctor who strikes fear into the hearts of enemies and slightly less fear into the hearts of his so-called friends. 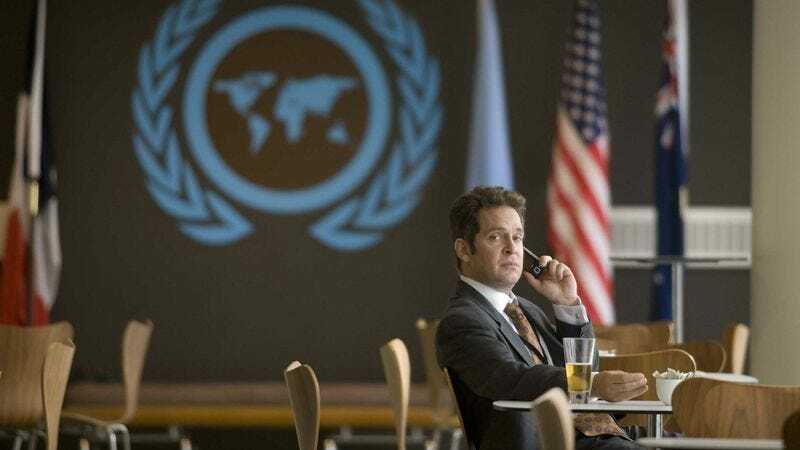 In another deviation from Iannucci’s series, In The Loop crosses the Atlantic, thrusting a hapless minister (Tom Hollander) into an international incident sparked by his use of the word “unforeseeable.” (That the resultant crisis bears little relation to his inciting malapropism is part of the gag.) Although the film drags Hollander home for a hilarious interlude with a constituent (Steve Coogan) incensed about the state of his garden wall, much of the film deliberately parallels the run-up to the war in Iraq, which lends its farce a bass note of tragedy. Iannucci doesn’t strive for verisimilitude, but his extensive D.C. research spawns too-close-for-comfort jokes like the fact that the (unnamed) president’s administration is staffed by fervent ideologues barely into their 20s. In character terms, In The Loop is less pessimistic than the show that inspired it, which never made room for a figure as relatively good-hearted as James Gandolfini’s U.S. lieutenant general. But on the political plane, it’s utterly, uncompromisingly bleak. Availability: DVD and Blu-ray, digital rental and purchase from Amazon Instant Video, and streaming from Netflix.